Jagdgruppe 50 was created on August 15, 1943 from Jagdgruppe Süd der ObdL that was formed as a high altitude fighter unit to combat recon Mosquitos on July 21, 1943. JGr.50 was led by Hermann Graf who gave birth to the unit´s crest painted under the canopy. The Red Hunter symbolized the German Luftwaffe soccer team known under the nickname 'die Roten Jäger'. Graf was a member of this team, along with then German national team members. The unit existed for only a few months, and in October 1943 was incorporated into I./JG 301. 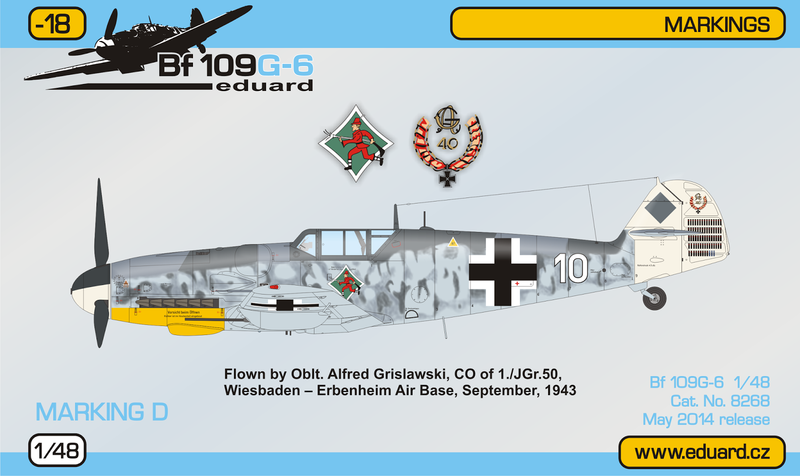 Alfred Grislawski was the CO of 1./JGr.50 and the formation leader, as can be seen from the white tail. He served with JG 1 and JG 53 afterwards, and his total score accounted for 133 victories. Grislawski was awarded the Knight´s Cross on July 1, 1943 and with Oak Leaves on April 11, 1944.
была преобразована в I./JG 301. Альфред Гриславски был главным в 1./JGr.50, а также лидером эскадрильи, это обзначено белым хвостом. Альфред также служил в JG 1 и JG 53, его суммарное количество сбитых самолетов равнялось 133. Гриславски был награжден Рыцарским Крестом 1-го июля 1943-го года и "Дубовыми Листьями" 11-го апреля 1944-го года.